Have a swarm of bees you need collected? Please remember that a swarm of honeybees will present itself in a cluster, sending out scout bees in search of a new nesting site. 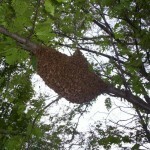 Honeybees in a structure is not a swarm, but rather an established colony. Removing an established colony is considerably more difficult and time consuming. This specialized service can cost several hundreds of dollars. 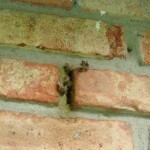 If you spot a swarm, act quickly before it moves into a wall or structure. If you already have an established colony, DO NOT kill them using pesticides! This option will lead to serious, undesirable consequences. Decaying bees produce a very foul odor and honey will seep through drywall leading to expensive cleanup and replacement. What should I do until someone can collect the swarm? 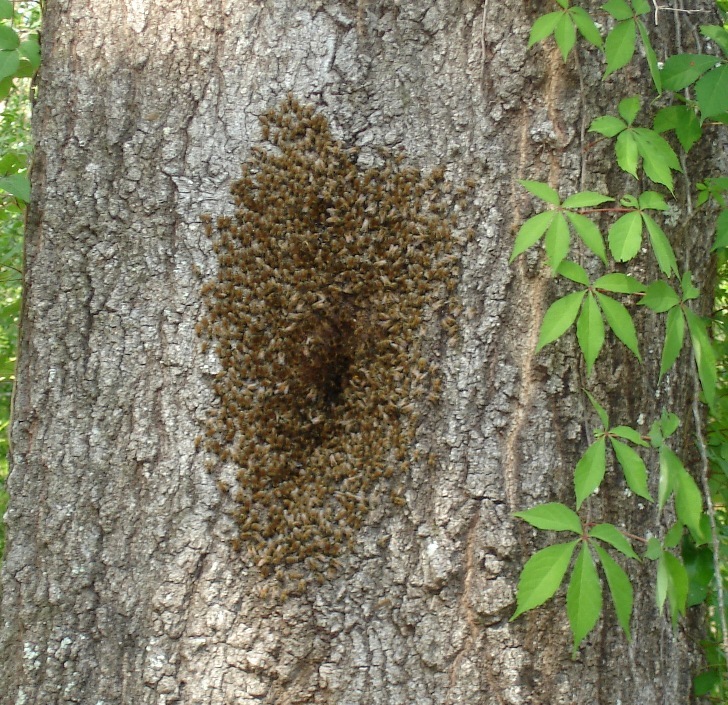 DO NOT SPRAY THE SWARM WITH ANY TYPE OF REPELLANT OR PESTICIDE! 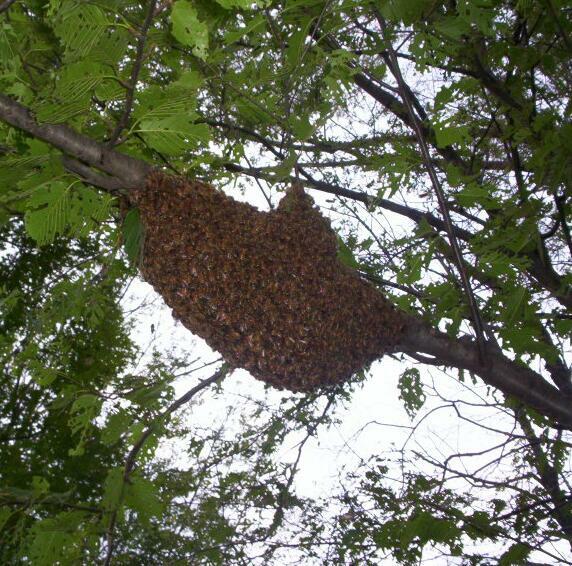 Although honeybee swarms can seem very intimidating with all the bees flying around, they are actually quite docile. In anticipation of needing to build wax comb at the new nesting site, honeybees gorge themselves on honey before swarming to get their wax glands producing. As a result, they feel the same way we do after eating Thanksgiving Dinner and have no desire to pick a fight with anyone. 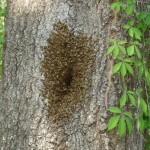 Swarms will cluster on a tree branch, or other surfaces as a waiting spot while scout bees search for a new nest location. Swarms usually move between 10AM and 3PM, outside of that time frame you can expect that they will stay put. Poor weather will also keep them from moving. If you have a swarm in that time frame and are waiting for a beekeeper, you can usually persuade the swarm to remain stationary by setting up a garden hose to lightly mist water above them. Do not soak them. 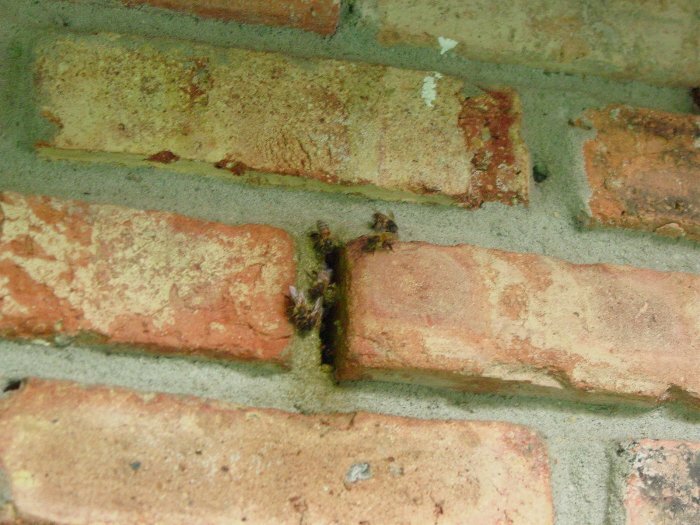 By keeping them in place, you are reducing the chances of them moving into a wall cavity of a structure. Once they move in, the whole situation immediately changes, as they are now a colony and not easily collected. 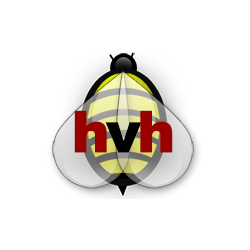 Visit Honeybees911.com to find a beekeeper to safely remove honeybees.